We’d only been in Bristol for 24 hours. Bubble wrap was everywhere, we were surrounded by a bedlam of cardboard boxes and our bed was a slightly dodgy blow-up mattress. It was all just feeling a little bizarre. Having moved around quite a bit over the last six years for work, we did what we know best in these situations – we ate. We left the new house madness, started exploring the city and feasted like we were going into hibernation. I’ve got to know every new place I’ve lived or travelled through hanging out at local cafes, pubs, restaurants, bars and street markets. You can people watch, sample the local brew and maybe even make some new friends. What’s not to like? Our first day of exploring Bristol ended at The Flyer, or The Bristol Flyer as it’s traditionally known. It’s a friendly pub on the eclectic Gloucester Road that serves all the well-known pub favourites you’d expect and offers an almost encyclopaedic range of world beers, wines and spirits. It had me at ‘over 16 types of cider’. 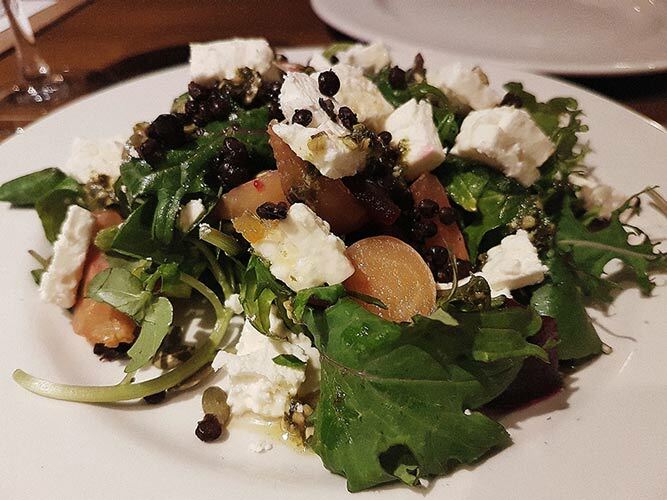 The cosy, buzzy atmosphere and comforting menu were just what the doctor ordered for us city newbies. The outside of the building evokes an art deco vibe with its angular wall face, but it’s all undercut by the flowers dangling down from the first floor windows and back lit butterfly above the door way. As you head inside, the paradox continues. The king-fisher blue-meets-emerald green walls give the air of an old fashioned gentlemen’s cigar lounge… before you spot the copper butterflies that adorn the walls and comfy booths and sofas beyond the bar. 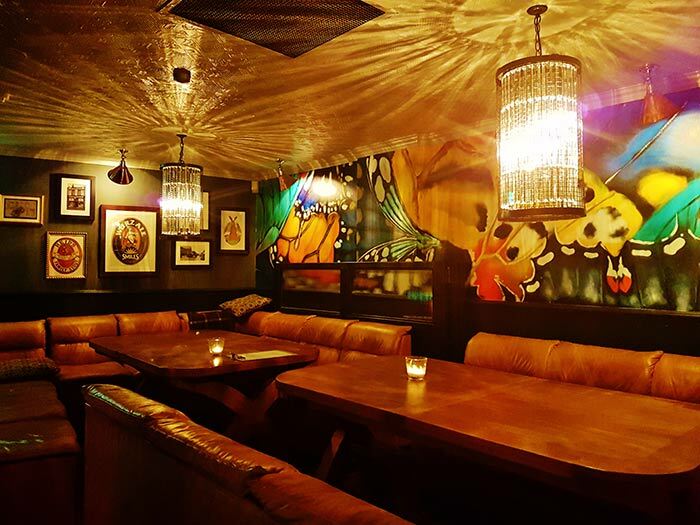 It’s clearly a popular haunt, but not frenetic and the mix of bare brick walls, quirky copper décor and homely lighting really work. There’s also an area at the back for bigger groups. It was empty at the time, but would be ideal for large group of family and friends who need more space to chill. Large (obv) glasses of merlot arrived as we perused the menu. We opted for the fried squid in sweet chilli glaze and roasted beets with feta and lovage pesto. The squid was fantastic, and fresh. There’s nothing worse than biting into a squid ring that resembles a fried elastic band. It was tender, came with a lotta fresh lime and was well-seasoned. The beetroot salad was equally zingy, sharp and creamy. The perfect way to open the show. Other tempting options included a handmade scotch egg and three cheese macaroni baked in horseradish, with a herb crust. 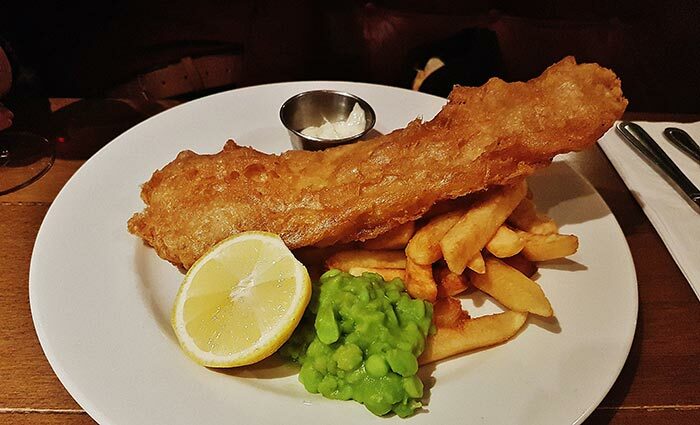 Next up was an all-time pub favourite – British ale battered cod with triple cooked chips and mushy peas. The chips were nothing special if you’re a fan of the ‘triple cooked’ trend, but the fish was delicious. The batter was light and crispy, and the fish perfectly flaky. The lemon and garlic roasted chicken with rich gravy took me right back to cosy dinners in my family’s dining room during the winter months. 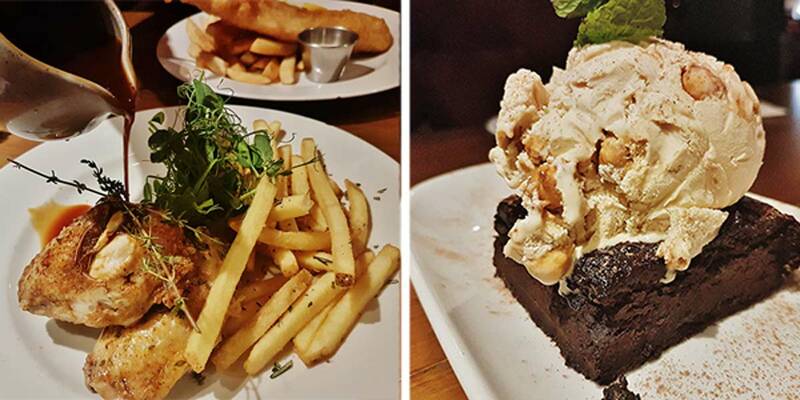 It was one of those meals that just makes you feel happy, and the rosemary fries went down a treat. Other main course options included herb crusted monkfish with sautéed heritage potatoes and stem broccoli in a butter sauce, as well as asparagus and sun blushed tomato risotto with Pecorino and pumpkin seeds. Now they say, ‘save the best til last’. The Flyer listened, and they did good. Realllll good. 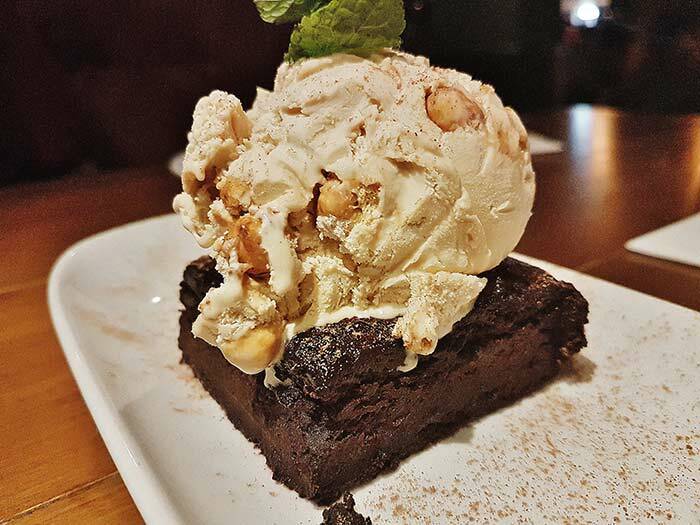 The warm chocolate brownie with hazelnut ice cream was one of the best puds I’ve ever had. Anyone who knows me well and the extent of my sweet tooth, would appreciate this must be saying something. Rich, gooey and with the darkest-of-the-dark chocolate, the brownie isn’t for the cocoa faint hearted. For chocolate lovers out there, you’re blessed with a generous slab of dessert heaven that will literally send you into a sugar coma. The sizeable scoop of ice cream on top is the perfect partner. Just try it, you’ll get it. The Tuscan style polenta, orange and almond cake was light and syrupy but didn’t match the brownie. It was a tough competition. Sticky toffee pudding and lemon tart were also up for grabs, but our tummies were sadly reaching the end of their tether. 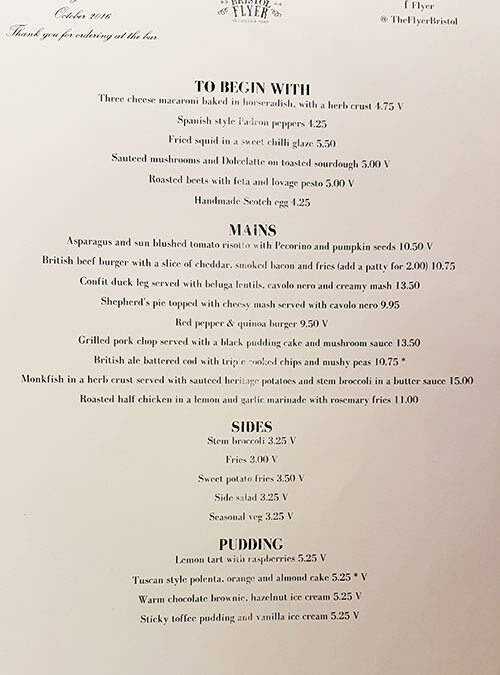 The Flyer’s new menu has only been around a few weeks and it evokes a real sense of ‘Britishness’. 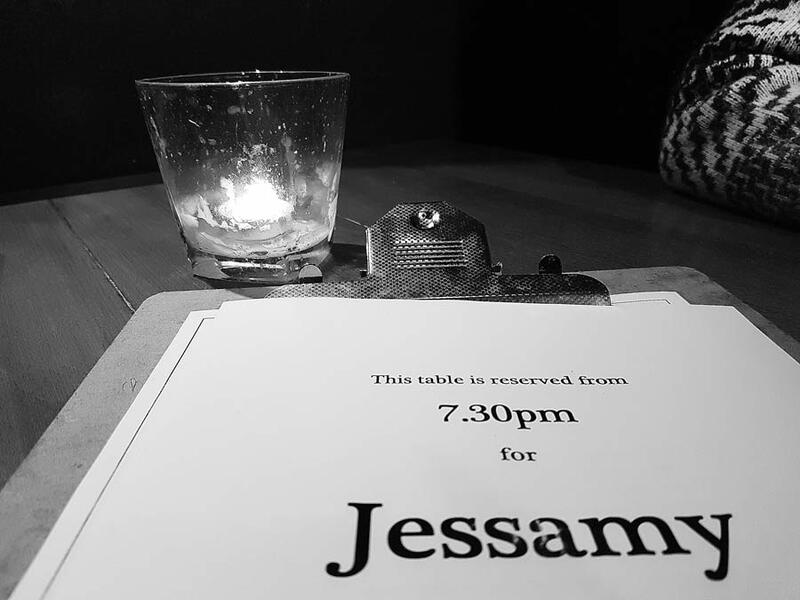 There’s a comforting, cosy feel about the place and the staff go the extra mile. It successfully balances beloved classics with the needs of many modern pub diners who are looking to eat their favourites with a twist. 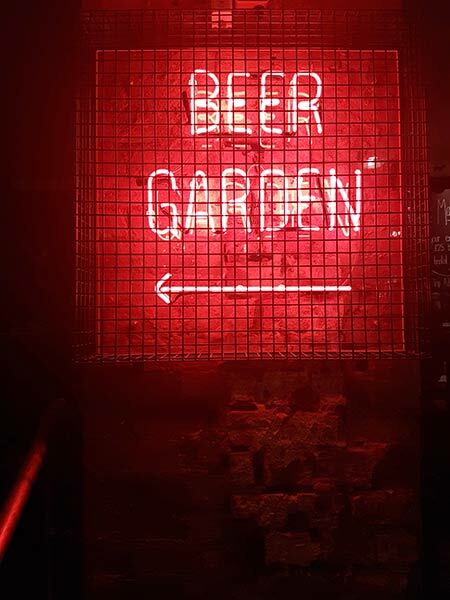 There’s a heated beer garden, free Bloody Marys with brunch every Saturday and Sunday, board games, free wifi, Sunday roasts, cheap pints on a Monday, disabled access and quiz nights. It’s also dog friendly, so you can bring your four-legged friends in for a glass of vino.